Lately I've been waking up so congested and am currently fighting off the remnants of a flu. When these photos were taken, I'd woken up with swollen eyelids and had decided to skip any eye makeup to avoid irritating them. Instead, I went with a cherry red lipstick, and man, did it pick my spirits up! 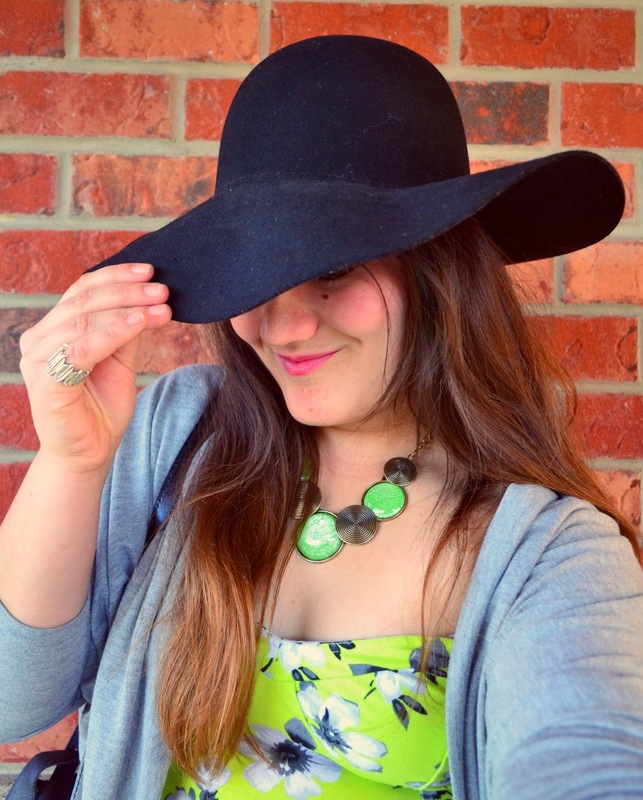 For fun I decided to top off my outfit with a floppy hat, and I couldn't help feeling a little glamorous in this outfit. 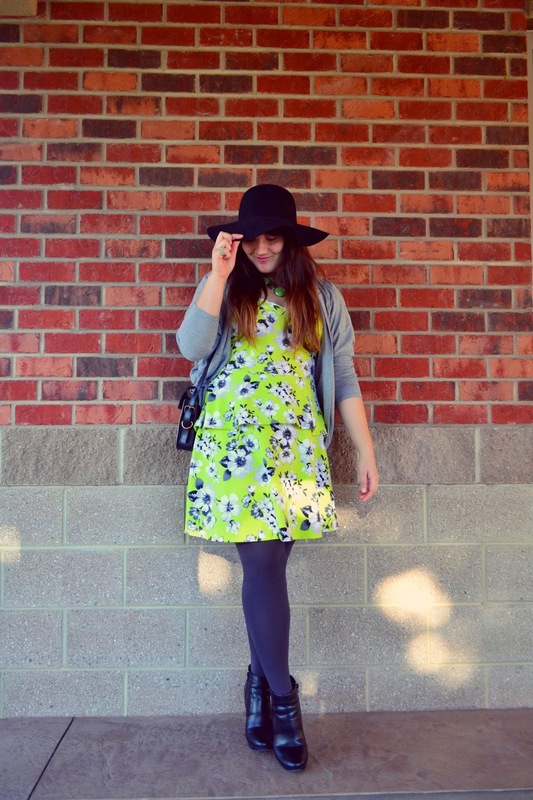 This electric lime dress is an old clearance find from Aeropostale this summer, and I'm embarrassed that I haven't worn it out yet. 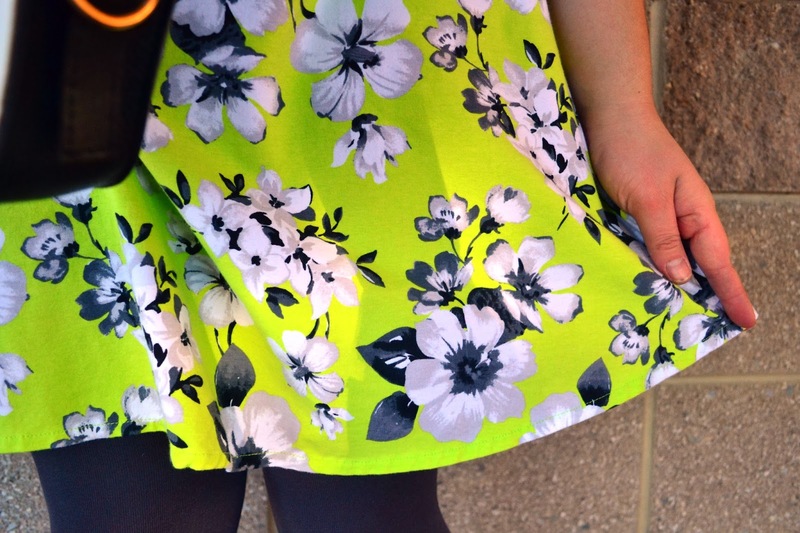 The pretty peplum and dark florals against a lime green color are such lovely touches! Accented with blacks and greys, it's perfect for going into winter. I received this necklace from Our World Boutique and it's such a lovely statement piece. The light green color matches the dress wonderfully. I wore it to work one day and a customer commented on it, saying it was, "booooootiful!" I'm not kidding, he pronounced it "booty-full" just like that. In school related news, registration for the spring semester have started (already??) and I've got my schedule all set up. Its unreal how fast this past year has flown by. Its possible that I may be done with my Associates degree by next summer! After that, who knows what will come next? So far, I'm trying to stay focused from day to day. Yet in my heart I can't help yearning for the future to get here already - there are a couple opportunities that I'd love to get started on! you do look glamourous in this outfit! You must have really nice lashes, my dear, since no eye make up doesn't effect you whatsoever! I really love the pictures on the staircase! You look so glam! 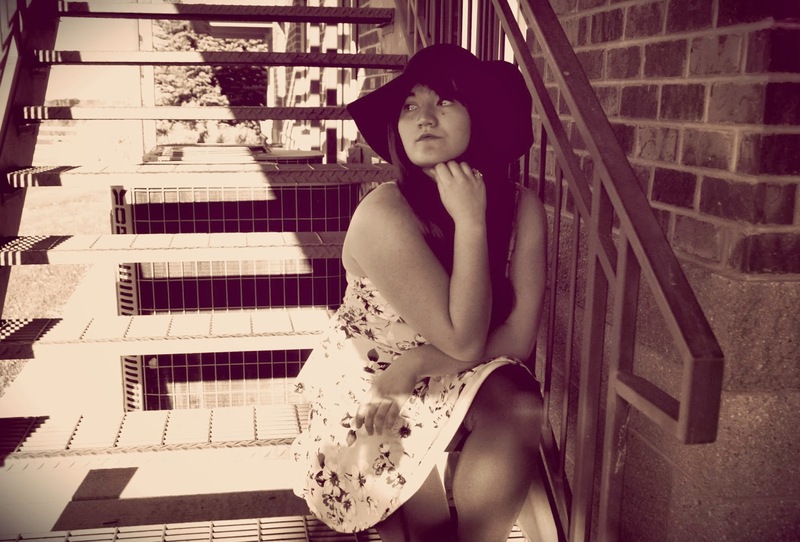 Just perfect in that dress and hat!!! ooh that dress is stunning! its a beautiful color surprise for the fall but i love it! :) i agree! this year is going so fast and i can't believe scheduling for next semester has started already! This is a really nice outfit !! I love your bag it's so funny :) And your hat is beautiful ! you look amazing linda! i would've never guessed you weren't feeling well. that dress looks awesome on you. i love both the color & print. also loving the tights. time passes so quickly. you've accomplished so much and it will prepare you for what's next in your life. 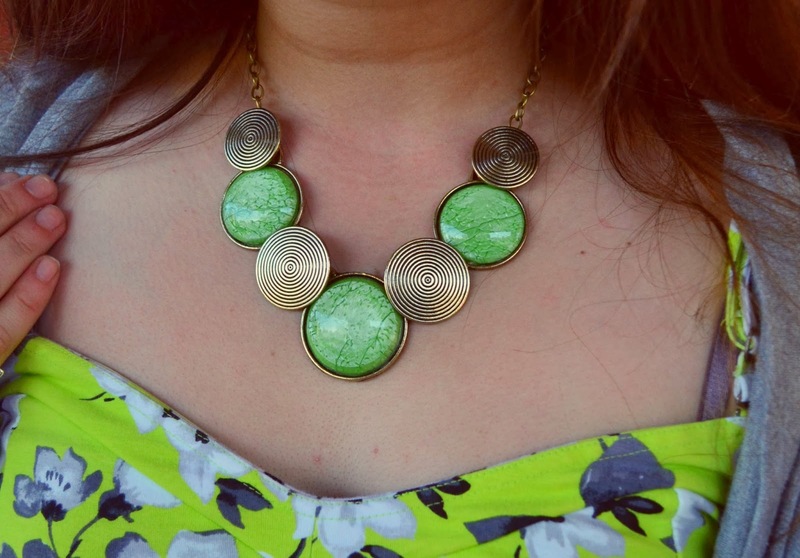 lime green is such a pretty colour and the dress does look lovely next to your new statement necklace. and yeah, I have also no idea where this year has vanished. it has just ticked away and I haven't even noticed how or when... life's probably way too busy, don't you think? Cute look ! 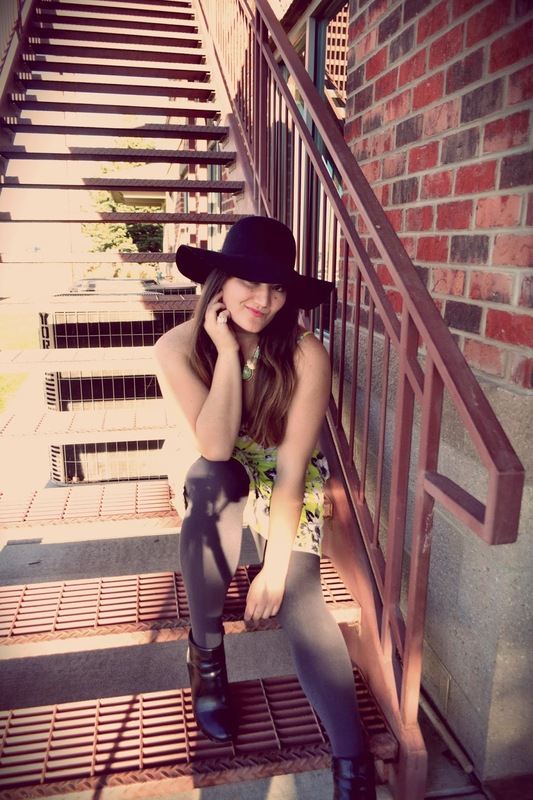 :) Love the print and color of the dress, and your hat too - I have one pretty similar. Sorry to hear you're ill but that red lipstick and floppy hat has hidden all the sins- you look great. That quote from the Bible... That should all our politicians get tattooed. On their foreheads. Frigging egotistic bastards... But anyways. :) Can that bag be even more adorable?! And you couldn't describe the color of the dress any better - that's ELECTRIC lime, love it! Cute dress. Hope you get better soon. pretty lime dress!! i love the hat too! have a great week Linda! 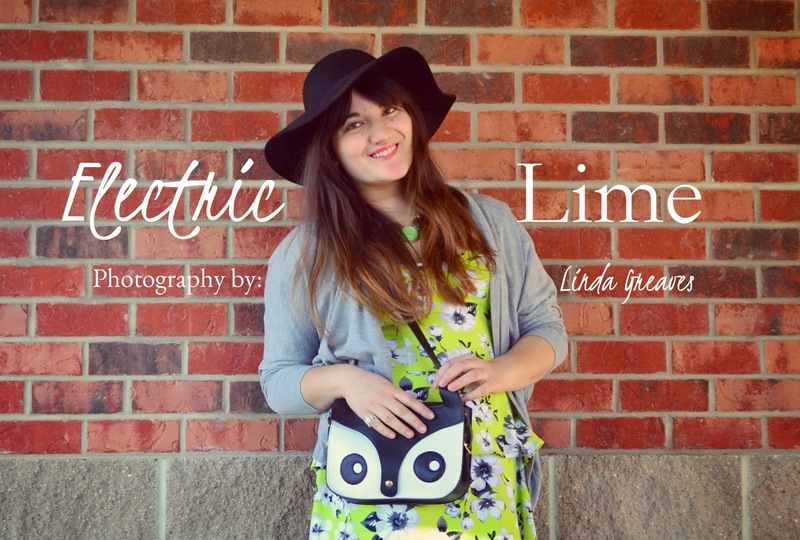 the lime color is really refreshing to see this time of the year!!! you look so feminine and pretty, dear! You are so cute and your outfit so absolutely stunning! Love the bright dress! That dress is very cute! I love the color and the floral pattern. Also, that handbag is very fun. Lovely look! you look amazing & the handbag is so cute! Perfect! I love that you made this dress work for winter! I'm usually not a huge fan of neons but I actually really like this dress! Must be the floral and the peplum ;) Love that cherry lip on you! Hi Linda, so great to see you in brights, this is such a pretty and vibrant dress, can't believe we haven't seen you in it before. Hope you feel better soon and are getting some rest. That bag is the cutest thing! What a beautiful vibrant dress! You look great. this outfit is flawless! love it! Hi Linda, I've got to say you look awesome and chic! You always show something original here at your blog) Lovely snapshots as well! 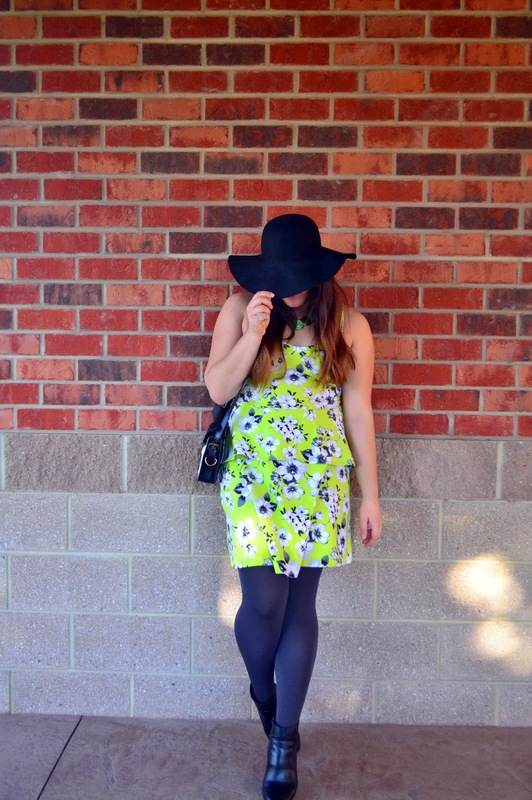 Love the idea of using a summer dress and pairing it with tights! Love this outfit! What a great & unique color :) and the raccoon bag, omg soo cute. ahhh the owl bag, so cute! and lovely dress, great styling! and wow good on you for taking outfit photos when still sick! You look so fab with the red lips! I hope you get better soon! i always felt like that first semester whizzes by- next thing you'll know it'll be finals time! and this dress is gorgeous- it's a good thing you finally busted it out ;) and that red lipstick really brought all the colors out! love the pop of color - you look gorgeous!!! look at you miss gorgeous! i really like this summer-to-fall-transition outfit!! i LOVE how you paired your summer dress with dark tones!!! it worked! so CHIC addition of that floppy hat and those boots!!! time really flies so fast when your enjoying every moment!! I love the color of this dress on you! And the hat just tops it all of. What a fun color you're rocking! I love the floral print too!